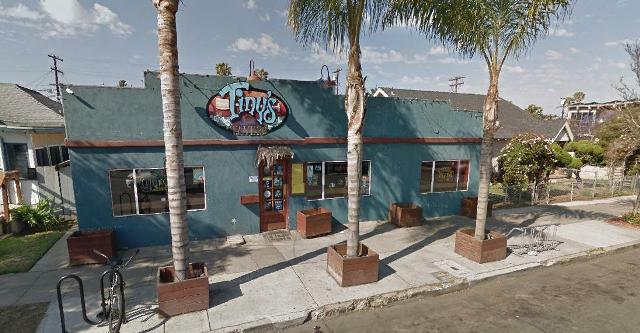 What’s Going On With “Tiny’s Tavern” in Ocean Beach? Customers and passersby are beginning to notice. “Tiny’s Tavern” – a venerable watering hole and small grill on Voltaire Street in Ocean Beach – is closed and its doors are locked. What’s going on? As close observers of the local scene as well as our readers may recall, Tiny of Tiny’s Tavern had an agreement with People’s Food Co-op Market. The property on which his business rested was sold to People’s and Tiny had an agreement with them to continue to operate his tavern for one year – then he was going to retire to Hawaii with his proceeds. And the market was going to use the property as part of their expansion. The expansion plans of … OB People’s Organic Food Market have been placed on hold due to the unfortunate and untimely death of “Tiny”, the owner of Tiny’s Tavern. The market co-op … on Voltaire Street in OB, has just recently purchased the two parcels of land directly to the store’s east, one containing a duplex and the other containing Tiny’s Tavern. And part of the store’s expansion plans were based on an agreement with “Tiny” who was on the verge of retiring from operating his bar and small grill. “Tiny” – the nickname of Alan Kajiwara – had planned to use the land sale to the co-op as a push for him to move back to Hawaii where he has family, but his fatal stroke at the age of 54 ended all that. And as Nancy Casady, the co-op’s CEO, told me … the store is “cooling our jets” in deference to Tiny’s family and to Dara, Tiny’s minority partner at the bar. “We’re in a holding pattern,” she said, “until the conditions and status of the bar are settled.” The store certainly does not wish to unsettle Tiny’s family or crowd more than they already are due to his death. Wanting an update on the situation, I called Nancy of People’s this morning to see what she knew. Apparently, Dara Rexroad – Tiny’s minority partner – had locked the doors at the tavern. People’s and Dara, Nancy told me, could not come to an agreement on how to proceed. From Nancy’s perspective, it appeared that Dara didn’t feel comfortable with the agreement being proposed. The Co-op had given Rexroad and the bar 3 months free rent in order to make the transition – starting in January. That’s about $1,900 a month, I was told, with the 3 months going to the end of April. Casady didn’t know why she closed the place early. Because the property was in People’s name, Nancy said, they were legally exposed should any incident or accident occur on the property. People’s would be on the hook. Also, there were structural problems with the buildings, and if the City cited anybody for any code violations – People’s would also be on the hook and be responsible for correcting them. This brought up the issue of the future of the building that Tiny’s Tavern was in. Nancy said, that in the process of figuring out the best use of the site, and catering to the wishes of their customers who want a sit-down vegetarian restaurant and organic juice bar, People’s is trying to decide what to do. I could tell by the sound of her voice, that she didn’t think there was much future in the old building. People’s needs parking; they want to put in a veggie restaurant and juice bar – and housing for some of its workers. They definitely have plans for the site. People’s will be going to the community for input. They plan, Casady said, to go to the OB Planning Board for feedback and to the OB Town Council for advice. They want to do what the community wants – in terms of their needed expansion. But Tiny’s patrons and fans are finally realizing they’re saying good-by to an old friend. In the meantime, we are trying to reach Dara for comment. Why didn’t peoples plan ahead and already have a design of what they were going to do? How can you not be prepared? Unbelievable. Why should they immediately have a plan? They don’t owe you anything. Making the plan CORRECT takes time. I really don’t care, nor did I say they owed me anything. Just seems to me it would have been a better use of time and money if they started the planning and designing the updates ahead of time. Now Tiny’s will sit there abandoned while they figure out what they want to do, then jump through political and financial hoops, and then they will finally start construction at some point. It just doesn’t scream good business plan to me, that’s all. You mean the same Peoples that doesn’t have any charging stations for electric vehicles ? The same Peoples where the parking lot is filled with gas-guzzling SUV’s ? And I’ve learned that apparently going vegan causes your arm muscles to waste away rendering you incapable of manipulating a turn-signal stalk so none of the people turning in there use them and are constantly causing accidents in either direction of Voltaire. Tiny was losing his business due to the sale of the property, not retiring. Isn’t it strange that the one year agreement that was offered to Tiny turned into a 3 month agreement after his passing? I will miss Tiny’s. It was one of the only really cool places in OB and felt almost like a family tome. 11yrs. wow! it went by fast. Thank you Tiny, Dara and all the super cool people that made that place the most ligit Tavern in San Diego! RIP Tiny! G.
I know this is probably a lost cause, but if public interest is really whats important, all parties involved really should reconsider and the public should rally to save Tiny’s. I had a fantastic surprise birthday thrown by my wife there, watched endless football games, and ate an incredible amount of food there. it was home for me, and for so many of my and my wife’s friends. they knew they could find us there. We had our wedding after party there, and it meant a lot to be in that space with people that we love. we have since moved to new orleans, and i can say that the best shrimp po boy has nothing on the shrimp burrito at tinys. i would love to have another bite and beer there when i visit in the future. tiny was a great guy. Club voltaire was the old bar there, it was pretty crazy, tiny made that spot homey, fun, and welcoming. Glad tiny showed us how good that place good be. he’ll be remembered. It’s unconscionable that People’s would put poor Dara out into the cold and even think about tearing down one of OB’s most historic buildings. The Corporation Commission records show that World Oil has taken a 51% stake in People’s, they are now just part of the fossil fuel industrial complex. Boycott People’s immediately and tell them were to put their couscous. Judi, Judi, Judi…..now that’s just not Truedy! Judi Curry…i couldn’t find any information on the corporation commission records validating your statement about World Oil…could you post a link or any kind of proof? Judi Curry, apparently you don’t understand how a coop works. Everyone that shops there and buys a membership owns 1 share, with no owner. There’s literally no way what you’re saying could be true. I’m as sad as anyone else that Tiny’s is gone, I ate and drank there all the time, but Tiny wanted to sell the property to move. It’s unfortunate that he wasn’t able to do that, but it doesn’t make People’s some horrible business. Sheeesh and I here I thought I was a member owner! RIP Tiny. Sorry for your loss. Sorry to Tiny’s fans for it’s impending loss. elsewhere in OB but none anywhere else of the other. I agree with hm. And the three months rent free preceded some very different terms. I’m a People’s Member but also a friend of Tiny’s. I’m very dissapointed in the Co-op. It will be a tough decision when my membership is up for renewal. I was really good friends with Tiny. He was the one who sold the bar, not Dara. His brother passed away a few months earlier and he was going to move back to Hawaii regardless, to be with his mother. Let’s just hope Dara hasn’t stole his money that was rightfully his mothers who was next of kin. He stated to me that his mothers house needed at least 25,000$ worth of renovation. He was planning on retiring and moving back , fix the house and spend much time lossed over the years with his family! He already was looking in what it would take to get Sebastion, his dog, on the island. So, if you want to hate on someone direct your hate to where it is deserved! That’s toward Dara who has used Tiny for years! Who didn’t even have the proper celebration for my friends death! There was a reason Tiny didn’t tell Dara, and sold the bar without her knowledge. The cook for over 9 years quit after Tiny passed because of Dara not paying him correctly! Sad because he worked there every day for 9 years and was treated like family by Tiny. Tiny was an amazing person that will truly be missed. Rip my friend. Wish every body in this world was as kind as you were. Sad the people who used him the worse while alive really just stomped on his grave! Btw, the previous owner of that property, has tried for years to get Tiny to buy that land. He offered it to Tiny first. Tiny opted out of buying the land because he knew he would retire and move home. So, people’s has done nothing wrong. If tiny wanted that property he could have and would have bought that land. He knew that building was coming down. He knew the issues that was wrong with that building. He didn’t for one minute think that People’s would do anything else but build a parking lot there. Pretty easy for you to sit behind a keyboard and make libelous statements, tough guy. You are no friend of Tiny or anyone who worked there. Newer Article: California water restrictions must include Nestlé, Big Ag and Big Oil!